ANAHEIM, Calif. -- Women are less likely than men to get CPR from a bystander and more likely to die, a new study suggests, and researchers think reluctance to touch a woman's chest might be one reason. Only 39 percent of women suffering cardiac arrest in a public place were given CPR versus 45 percent of men, and men were 23 percent more likely to survive, the study found. It involved nearly 20,000 cases around the country and is the first to examine gender differences in receiving heart help from the public versus professional responders. "It can be kind of daunting thinking about pushing hard and fast on the center of a woman's chest" and some people may fear they are hurting her, said Audrey Blewer, a University of Pennsylvania researcher who led the study. Rescuers also may worry about moving a woman's clothing to get better access, or touching breasts to do CPR, but doing it properly "shouldn't entail that," said another study leader, U Penn's Dr. Benjamin Abella. "You put your hands on the sternum, which is the middle of the chest. In theory, you're touching in between the breasts." The study was discussed Sunday at an American Heart Association conference in Anaheim. Cardiac arrest occurs when the heart suddenly stops pumping, usually because of a rhythm problem. More than 350,000 Americans each year suffer one in settings other than a hospital. About 90 percent of them die, but CPR can double or triple survival odds. "This is not a time to be squeamish because it's a life and death situation," Abella said. 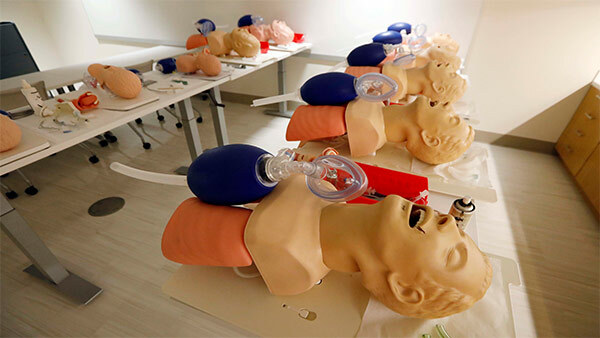 The findings suggest that CPR training may need to be improved. Even that may be subtly biased toward males - practice mannequins (they're not called "woman-nequins") are usually male torsos, Blewer said. "All of us are going to have to take a closer look at this" gender issue, said the Mayo Clinic's Dr. Roger White, who co-directs the paramedic program for the city of Rochester, Minnesota. He said he has long worried that large breasts may impede proper placement of defibrillator pads if women need a shock to restore normal heart rhythm. The Heart Association and the National Institutes of Health funded the study. "It's a very awkward situation, and a very horrifying situation to be one of the two people who survives," but more would survive if CPR rates were higher, Chugh said. Results were published in the Journal of the American College of Cardiology.